How to Choose and Clean Window Blinds Easily? Blinds and shades are perfect window treatments because they block out the sun better than curtains do and they are easier to open and close. Vertical blinds and shades also accumulate less dust and pet dander than curtains, making them the best choice for people with allergies. The right window blinds make a room look sophisticated and well-designed, but some people avoid them for one reason — they think cleaning them is difficult. The truth is once you learn how to choose the best set of blinds for the rooms in your home and how to clean window blinds easily, the task of keeping them clean is about as simple as dusting your furniture. You might feel a little overwhelmed when you see many options available today for blinds and shades. However, when you understand the purpose for each product, it will be easier for you to select the right ones to fit your particular needs. Bathrooms and Kitchens: You want your bathroom to be well-lit without sacrificing privacy. You’ll also want to keep in mind there’s a lot of moisture in a bathroom. These factors influence your available choices. Likewise, a kitchen window can be exposed to a lot of humidity from the sink as well as boiling pots. Aluminum blinds will work fine in a bathroom or a kitchen because moisture won’t hurt them, but they may not offer the homey look you want. A better option may be a faux wood blind. The great thing about faux wood is that it provides the warm look of real wood, but it can handle moisture better since humidity can warp and damage real wood blinds. Other options that offer more privacy without blocking out all the light are solar shades and dual shades. 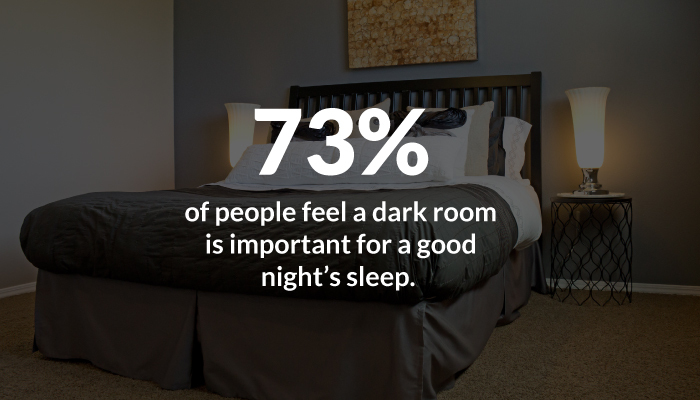 Bedrooms: According to the National Sleep Foundation, 73% of people feel a dark room is important for a good night’s sleep. If you have headlights shining into your bedroom at night, if you’re a day sleeper or if you have a baby who is trying to learn to sleep at night, day-night cellular shades, room-darkening shades or Roman shades are just what you need. If you prefer blinds, consider wood blinds. Living Areas: Your living room or family room will require versatility. You might want it as dark as possible for an evening of horror flicks but prefer the room to be bright and cheerful for daytime visitors. Vertical blinds will provide versatility and elegance in these areas. Cellular shades, sheer shades and pleated shades are also beautiful options. Special Spaces: Don’t forget you can also buy blinds specifically for skylights and patio doors. And if you have a sunroom or breezeway, you will find that natural shades are a perfect fit. Exterior solar shades are ideal for porches, gazebos and other outdoor sitting areas. Basement and rec room areas are excellent for aluminum blinds. Office spaces are ideal for aluminum, vinyl or composite blinds, depending on the look you want to achieve. If you need to divide a large room, basement space or meeting area, sliding panel tracks will provide extra privacy when needed. 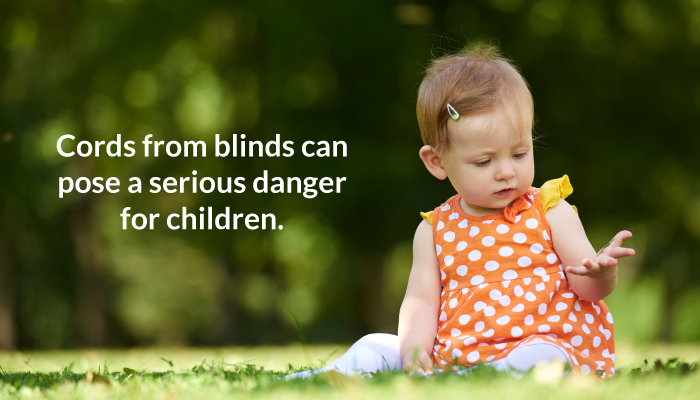 A note about kids and pets: Cords from blinds can pose a serious danger to children and pets alike. If this is a concern in your home, try motorised shades or cordless blinds. This is especially important in the nursery and playroom. Not only are they safer, but many customers feel they offer a tidier look as well. As you can see, there is a perfect product for any need you have in your home. All you need to know is what each space will be used for and you can easily choose what you need. You also have a large colour selection to browse. Some people prefer neutral colours to allow for more versatility in interior decoration. Others like to make a statement with their window coverings by using bolder colours. All that’s left is to choose your favourite valance or cornice, and you’ll have transformed each room in your home to something you never before imagined — all without breaking your budget! Now that you know what types of shades and blinds you need for your space, here are our tips for keeping them clean and attractive. The best way to clean window blinds or shades will depend largely on what type you have, but all blinds and shades can be dusted with a brush attachment of your vacuum cleaner. Depending on the model of your vacuum cleaner, you can also purchase a dusting attachment made specifically for blinds, which makes the job of cleaning your blinds even easier. Some of these attachments consist of a soft brush while others are made with finger-like brushes that get between multiple slats at once, making the whole task move along more quickly. To dust off your blinds with a vacuum that has a basic brush attachment, start at the top and work your way down. Cleaning this way allows you to catch any dust that falls instead of knocking it onto sections you have already cleaned. Use this method when cleaning horizontal blinds and when cleaning vertical blinds. Close the blinds to run the brush over the slats on one side. Then turn the slats so they face the other direction and vacuum over them again. Simple! Just be careful to set the suction of your vacuum cleaner on low or you could damage your blinds. If your blinds haven’t been cleaned in a while, the dirt may be a little more stubborn. In this case, you will need something more than just your vacuum. As with vacuuming, make sure to start at the top of the blinds and work your way down. A handheld duster can be gently brushed between each slat to pick up dust. And you’re no longer limited to just using a handheld feather duster for dusting chores these days. You may be surprised at the options you have available to you. There are microfibre dusters that can be thrown in the washing machine after each use. You can also get disposable dusters that collect the dust and then are simply thrown away. Disposable handheld dusters are an especially good option for people with allergies. 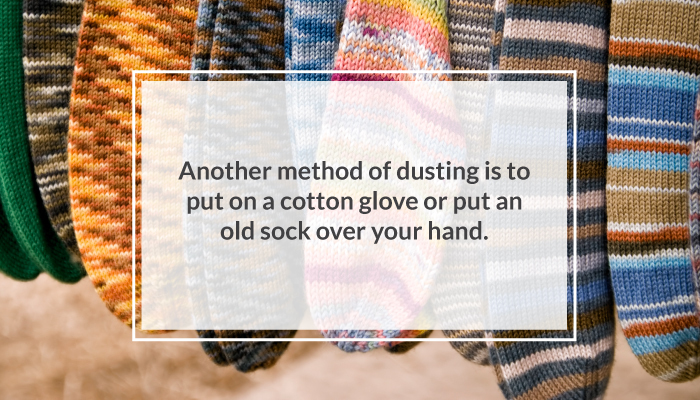 Another method of dusting is to put on a cotton glove or put an old sock over your hand. Run your fingers along the top and bottom surface of each slat, being careful not to bend or break them, and rub the dust right off. Both the handheld duster and the cotton glove or sock will need to be shaken off periodically as the dust builds up on the cleaning tool. Fabric shades and blinds can also be dusted using a lint roller. This allows you to pick up dust, hair and dirt and throw it away with the sticky paper. Whether vacuuming or hand-dusting your blinds, hold the bottom rail of the blind to keep it still and taut while you clean. Of course, when blinds get coated in kitchen grease or other sticky dirt, you’ll need to put a little more effort into getting them clean beyond just dusting. Aluminum and vinyl blinds are probably the simplest to clean. You can take them down and soak them in the bathtub with soapy water or, if the weather permits, take them outside and spray them with the hose after spraying them with a little soap. If you keep up with regular dusting, you should only need to wash your blinds this way once or twice a year. Cleaning faux wood blinds is similar to cleaning aluminum and vinyl blinds in that they can usually be dusted easily with a handheld duster or vacuum cleaner brush attachment. More stubborn dirt can be spot-cleaned with vinegar. Just dip a cloth into the vinegar and wipe away dust and grime. Cotton gloves are also nice to use with vinegar because you can dip your gloved fingers into the vinegar and rub out the spots. This gives you a little more control than when you use a tool for cleaning your blinds. Blinds made from wood need a bit more care to keep the wood in good condition. Water ruins wood because it leaves spots and causes warping. Vinegar, as with faux wood blinds, is a good cleaner for greasy blinds, but be sure not to leave your wooden blinds wet. The smartest option is to clean the blinds and then wipe the slats with a soft towel or paper towel to absorb any excess moisture. Furniture polish or lemon oil is also excellent for cleaning wooden blinds. These products have the added benefits of protecting the wood and adding shine. Polish your blinds the same way you would dust them, using a soft, clean cloth to wipe each slat on both sides. People with allergies sometimes prefer shades because they can be rolled up, preventing the dust build-up that occurs with blinds. 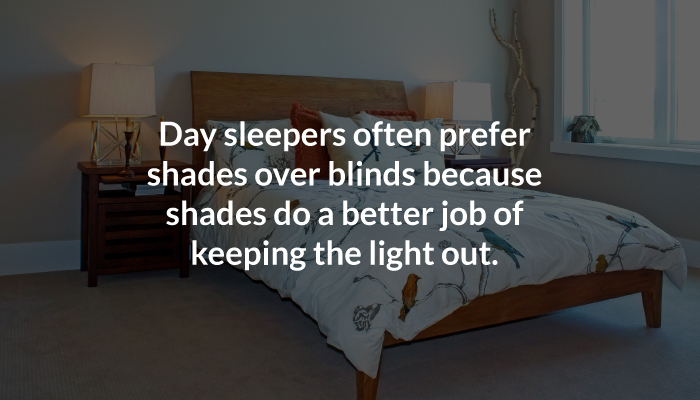 Day sleepers often prefer shades over blinds because shades do a better job of keeping the light out. If you want to learn how to clean window shades, the techniques for cleaning both fabric blinds and shades are pretty much the same. Whether you choose fabric shades or blinds, fabric needs to be handled a bit differently from most other materials. While you can easily vacuum fabric blinds just as you can other types of blinds, you won’t want to soak them in the bathtub or use furniture polish to clean the stubborn spots. These areas should be gently blotted with a clean cloth dipped in warm soapy water. Avoid hot water that can shrink and distort the fabric. Wring out any excess water on the cloth so you don’t saturate your fabric blinds. Fabric can be blotted dry with a clean towel or gently dried with a cool blow dryer. If the spots remain, take your fabric blinds or shades to a dry cleaner to be cleaned professionally. Nicotine is challenging to clean. Not only does it leave unsightly yellow stains on fabrics and surfaces, but it also leaves an unpleasant odour. You can mix a quart of water with a half teaspoon of dish soap and a tablespoon of vinegar and wash the slats of faux wood and wood blinds with a cloth soaked in this cleaning solution. Be sure to wipe the slats down with clean water and dry with a soft towel to prevent the slats from becoming damaged. Alternately, blinds that can be soaked, like aluminum blinds, can be placed into this solution in a bathtub and left to soak for 15-20 minutes. If there is still some remaining residue, mix one part rubbing alcohol with five parts of water. Wipe the slats down as you did above (a cotton glove will make it easier). Then wipe them down again with clean water and dry with a towel. Fabric blinds and shades will need to be treated a little different. You can try to sponge-clean spots with a mixture of diluted vinegar or water with a few drops of dish soap. Blot stains carefully with a sponge or clean cloth. If the fabric is colour-fast, you can also try a bit of hydrogen peroxide that is diluted with water, but be sure to try this in an inconspicuous place first. If the nicotine stains refuse to budge from the fabric, consider having the blinds or shades professionally cleaned. One of the biggest concerns about cleaning blinds and shades involves dust. There are some tricks to help keep your blinds, as well as your home, as dust-free as possible. Weekly dusting is important for keeping dust at a minimum. To help keep your blinds dust-free, you can rub them down with a dryer sheet. Dryer sheets repel static that attracts and holds onto dust. Along these same lines, you can make your own dust repellent by mixing one part fabric softener with four parts of water into a spray bottle. Spray the mixture lightly on a clean cloth and dust as you normally would. Keep pets brushed to prevent dander and hair from floating around your house. Be sure to keep the filters from your furnace and air conditioner clean. Replace them as often as necessary to prevent dust from being blown around your house. If you have curtains as well as blinds over your windows, make sure to wash them or have them professionally cleaned on a regular basis. Dust mites like to live in fabrics where dust can settle in and accumulate. What are the Best Dust-Free Window Blinds and Shades? Of course, the easiest way to have clean window blinds and shades is to purchase blinds and shades that require little cleaning! Cellular types of fabric shades have the added honeycomb-like space within each “slat” where you might expect dust to accumulate. Fortunately, this style of blinds is about the easiest to clean. Just use your vacuum’s brush attachment. You might be surprised to learn that cellular shades are treated to repel static and stains, so by purchasing them, you may have fewer dusting chores than with other styles of shades or blinds. Vertical blinds are a perfect choice for people who need to keep dust as minimal as possible. Vertical blinds are commonly thought of as dust-free window blinds because there are no horizontal slats for the dust to settle on. Roller shades are considered dust-free for the same reason. All these choices will give you the beauty and privacy you want for your windows while keeping the cleaning to a minimum. Don’t be intimidated by the tasks of choosing and cleaning your blinds and shades. As with any household task, keeping up with regular dusting is easier than waiting until you can see dust piling up from across the room. Regular cleaning also keeps your shades and blinds in good condition. And purchasing dust-free blinds or shades will make your job as easy as possible. Think of it as a simple way to protect your investment and keep your home beautiful and welcoming. At ZebraBlinds.ca we believe fashion, function and quality can go together, and we are here to help you make the right choices. Oh great, I just bought some blinds for my home, I really loved them. Can I just say what a reduction to find someone who actually knows what theyre talking about on the internet. You positively know the best way to carry a difficulty to gentle and make it important. More people need to read this and understand this side of the story. I cant believe youre not more in style because you undoubtedly have the gift.